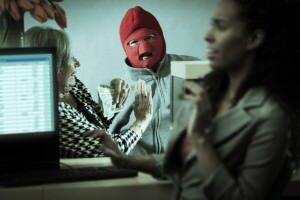 While banks have long been considered a logical target for the criminally minded looking for an easy score, few individuals are successful evading law enforcement having perpetuated a bank robbery. Asked why he robbed banks, the notorious WILLIE SUTTON explained to one journalist “because that’s where the money is.” But his reply provided little or no explanation reflecting on the wisdom making such a decision–siting in a jail cell talking about his crimes. An “inherently simple crime,” according to Dugan Arnett writing for The Kansas City Star, requiring little or no “equipment or preparations–just a bank, a hand gun or the threat of one, and someone crazy enough to try it.” The risk reward quotient he says, makes it a “doomed venture,” citing the less-than-stellar chances getting away with the crime, the stiff federal penalties if caught and prosecuted, and the amount of money actually gained. Law enforcement officials think some crooks have read the tea leaves. The FBI’s Uniform Crime Report reflects during a 10-year period bank robbery violations are down, reporting 7,556 incidents in 2004 and only 3,961 incidents in 2014, with most bank robbery occurrences solved by law enforcement authorities. Historically speaking, the FBI was made the primary agency responsible for bank robbery violations mostly because gangsters like BONNIE & CLYDE and JOHN DILLINGER had captured the public’s attention–evading police–committing robbery after bank robbery. Listening to constituents, in 1934, Congress made bank robbery a federal violation giving the FBI jurisdiction in any incident involving a national or state member bank of the Federal Reserve. Officials later amended the bank robbery statute to include bank burglary, bank larceny and other bank related offenses. Since being awarded jurisdiction for bank robbery offenses, FBI Special Agents have become experts making threat assessments for local banking institutions, identifying common characteristics used by known bank robber felons and/or helping local jurisdictions identify suspects thought to be robbing banks in neighboring states. Today, unless a bank robbery is classified as being committed by a serial bank robber and/or the bank robbery involves special circumstances like a teller being assaulted, local law enforcement generally handles the prosecution. Members can be extremely helpful to anyone seeking information and/or requiring a professional opinion concerning a bank robbery suspect or incident. Looking for an expert, visitors need only use the website’s search feature, entering the appropriate skill, as well as the interested geographical area to make contact with an FBI specialist and, thereafter, make contact using the information provided. Retired FBI Agents and Analysts, interested in securing a Directory listing and/or a personal email address, need only submit a brief online application to join the website.